really? Why isn't it being said? and which Deacon Service Book is it in? I have checked all the ones that I have and there is nothing in there extra. Btw do you have any other recordings of this... honestly this is the first time I have ever heard it! Oh, this is osanna. the text can be found in the nahdet el-kanayes khidmit shamas. I can tell you the translation is wrong and the Greek orthography is wrong. Ⲱⲥⲁⲛⲛⲁ ⲉⲛ ⲧⲓⲥ ⲩⲯⲓⲥⲧⲓⲥ. Ⲉⲩⲗⲟⲅⲩⲙⲉⲛⲟⲥ ⲟ ⲁⲛⲉⲗⲑⲱⲛ ⲉⲣⲭⲟⲙⲉⲛⲟⲥ ⲉⲛ ⲟⲛⲟⲙⲁⲧⲓ Ⲕⲩⲣⲓⲟⲩ. Ⲱⲥⲁⲛⲛⲁ ⲉⲛ ⲧⲓⲥ ⲩⲯⲓⲥⲧⲓⲥ. Notice there are many ways to write this in Coptic since Copto-Greek does not follow Greek orthography. I used the most common Coptic spelling of these Greek words. Also, I am not sure if the Greek ending for anelthwn is grammatically correct. The Arabic translation writes "Hosanna in the highest. Blessed is he who came and comes in the name of the Lord. Hosanna in the highest." If following my revised Greek text, it would translate as "Hosanna in the highest. Blessed is he who goes up and comes in the name of the Lord. Hosanna in the highest." These are two different theological meanings. I think theologically, this hymn is alluding to Psalm 121:4 "That is where the tribes go up—the tribes of the Lord—to praise the name of the Lord according to the statute given to Israel." In other words, those who go up to praise in the name of the Lord, they will be saved by Hosanna." This hymn is very reminiscent of the Sahidic manuscript I am studying now with Ramez's help. This manuscript also has many Greek hymns (psalms, psaltery, troporia, antiphons, trisagions, prokimena, poekon) that I have found is currently part of our hymnographic tradition but not practiced or not understood. How's that for some speculation? @Faithful Servant - Thanks for sharing this interesting hymn. @meenasamy - Thanks for sharing the source! It seems to me that it's evoking the language of Isaiah 6 (6:3 and by extension Revelations 4:8) in the first part "Agios Kyrios Sabaoth." Interestingly H.G. Anba David recently discussed this passage: showing how it contains a symbolic reference to the Eucharist (Isaiah 6:7). The second part "Hosanna En Tis" is definitely evoking the Entry into Jerusalem; Mark 11:9-10, etc. It's a truly beautiful hymn to meditate on; thank God such things have been preserved to this time. I truly think that hymnology and poetry can be some of the most amazing transmitters of theology. 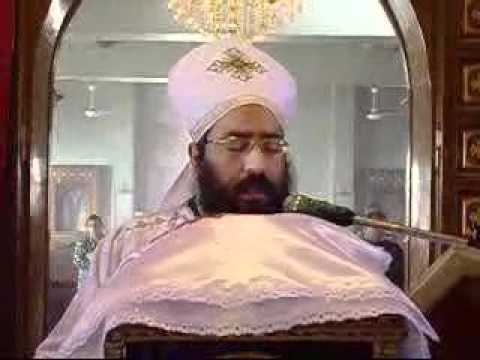 May our Church also invest in the rich Orthodox hymnographic traditions for the life of the world. @minatasgeel would you be able to add the text to the lyrics library here? Language: The Greek in Nahdet Al-Kana'es, as well as the posted recording is not wrong grammatically or even theologically. It translates well into "Hosanna in the highest. Blessed is He who came and is coming in the name of the Lord. Hosanna in the highest". Perhaps it is referring to Christ's first coming, His incarnation - He who came - and His awaited second coming - He who is coming. Notice that the second clause is actually in the present, not the simple future, communicating perhaps the same sense of immediacy felt by the children of Jerusalem at the entrance of the Lord. Theologically: The Lord indeed comes in various forms and means. As I said in a previous post, His coming and presence is revealed in Scripture at the liturgy of the Word....it is revealed later, more mystically in the Eucharist itself...it is also revealed in the fullness of His body, the Church, "Where two or three are gathered in my name....", and it is our duty as children of God, and heirs by grace, to reveal Him to the world in countless ways. That being said, at that specific moment in the Divine Liturgy, the idea is that as we praise God's creating of "heaven, and earth, and all that is therein," including the various ranks of angels, we are joined to them at the climactic singing of the Sanctus, or the Triumphant Hymn as it is called in the Liturgy of St. John Chrysostom and St. Gregory. It is in this sense most especially that we can speak of Christ's coming at this moment in the present, experiencing this presence, glory, and majesty that fills heaven and earth before His throne. The Triumphant Hymn (in its familiar short text, without the addition) is therefore integral to the Alexandrian liturgical ethos, which prefers to interpret the liturgy as a journey upwards in the eschaton, where the rituals, ranks, and hymns are meant to be expressions here on earth of the heavenly liturgy that is constantly ongoing. In fact, many scholars have hypothesized that the Triumphant Hymn was first used in the liturgy in Egypt, and spread from there to other regions. ὡσαννὰ ἐν τοῖς ὑψίστοις. Εὐλογημένος ὁ ἐρχόμενος ἐν ὀνόματι Κυρίου. Ὡσαννὰ ὁ ἐν τοῖς ὑψίστοις. Hosanna in the highest. Blessed is He who comes in the name of the Lord. Hosanna in the highest. Clearly we can see that the Byzantine text is more faithful to the Biblical quote, which probably means it is older than our own similar addition. Theologically, if I recall, I have read a meditation on this by Hieromonk Gregorios of Mt. Athos (of blessed memory), that at this juncture in the liturgy, as we proclaim saying "heaven and earth are full of Your glory," we likewise join the praise of heaven "Holy Holy Holy..." to that of earth, "Hosanna in the highest," revealing by our own praise that heaven and earth are indeed joined together at this moment in praising the Lord of Hosts. I don't see how elthwn is correct for "came" but you're the expert so I defer to you. Can you please explain elthwn grammatically? Was the intended word ἀνελθών? Theologically and liturgically, everything you said makes sense. I apologize if my comments were premature. I had to double check to make sure I am not forgetting my Ancient Greek, but ελθών is an aorist participle of έρχομαι (to come). Participles in Greek can be used circumstantially (Walking down the street, a tree fell), or as attributive adjectives, (Blessed is the one who came and who comes). In Greek also, some verbs have different stems or principal parts in the different tenses. So the present stem έρχo becomes έλθ- in the past and ελευ- in the future. That's how we can distinguish the two participles here elthon and erkhomenos as past and present respectively. The participle ανελθών familiar to us from Asomen and Agios is a compound verb of ανά (up) and the past stem έλθ.....meaning to ascend. Very well said @RamezM. It's always reassuring to me when an expert ENOUGH explains that a hymn isn't grammatically incorrect because there are too many arguments nowadays commenting that which to me is one factor why we're gradually losing faith in their genuineness and true meanings. How are all the Priests singing together?